The Mahogany brand from Hallmark provides the most extensive offering of cards available for African American consumers. With 42 million people, African Americans account for 13.6 percent of the total US population (Source: US Census Bureau, The Black Population: 2010). Hallmark began offering cards relevant for African Americans in the 1962 and introduced the Mahogany line in 1987. Mahogany is a personal expression brand that provides an authentic and engaging experience for African Americans and those inspired by African American culture. The card line exists to enhance emotional connections between family, friends and the community by capturing what’s most beloved and valued about African American culture. Hallmark has been creating cards that speak to African American culture since the 1960s. The company first introduced the Mahogany name in 1987 as a 16-card promotion. Mahogany became a year-round brand offering both everyday and seasonal cards in 1991. Through the years, Mahogany has collaborated with well-known African Americans such as Jill Scott, Maya Angelou, T.D. Jakes and Iyanla Vanzant. The brand also partnered with the U.S. Postal Service in 1999 to celebrate the accomplishments of African Americans in history through the Legacy of Greatness cards that coordinated with the collectible postage stamps of the same name. 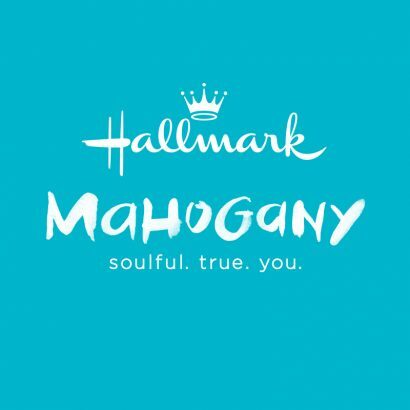 Connect with Mahogany on Hallmark.com, Facebook and Instagram. Hallmark Mahogany features everyday and seasonal cards to help African Americans honor their relationships in innovative, compelling and culturally-relevant ways. The line features cards appropriate for both adults and children. Mahogany offers cards for several seasons – Valentine’s Day, Easter, Mother’s Day, Father’s Day, graduation, Christmas and Kwanzaa – as well as a full range of everyday occasions such as birthday, thinking of you, get well, wedding, anniversary, sympathy and more. The line also includes Christmas boxed cards. Sentiments range from deeply religious to lightly spiritual, from poetic and sophisticated to casual and humorous. Authentic language an themes reflect the diverse culture, families and relationships.